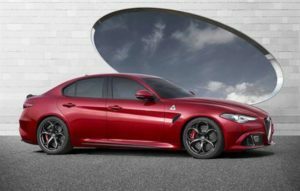 The new Alfa Romeo Giulia Saloon is in many ways a typical Alfa Romeo: It’s stylish, luxurious and lots of fun to drive. 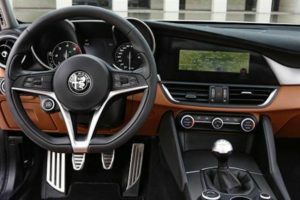 If you fancy a suave Italian alternative to Mercedes C-Class or BMW 3 Series Saloon, it represents an excellent choice in an exec saloon market that needs Alfa Romeo’s unique blend of flair and performance. For the Italian brand themselves, the Giulia is a key car. Alfa Romeo hasn’t produced an exec-saloon in over five years, which has seen the powerful German brands sweep ahead in this sector. Despite their absence, Alfa Romeo has returned as though they’ve never been away, and the Giulia has all the attributes buyers want from a car like this, such as elegance, robustness and an impressive interior. OSV takes a closer look at what it’s all about with our Alfa Romeo Giulia review. 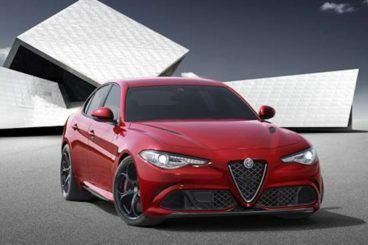 The Giulia manages to be both perforative and comfortable. It’s a good blend, and one which is helped by the rear-wheel-drive setup. Enthusiasts will like this as it means the car can offer a pure driving experience. It also means the car is in direct competition with the rear-wheel-drive BMW 3 Series. In pretty much any condition, this Alfa Romeo Saloon is fun to drive. It offers more engagement than the C-Class, and because the brand have used aluminium for the bodywork, it’s much lighter than many of its rivals. This improves its agility, as well as its fuel economy. The downside is that, strangely enough, there is no manual gearbox available. The 8-speed automatic is not any kind of substitute for keener drivers, but it’s quick and smooth at changing gears. Moreover, it’s got lots of control and is as engaging as they come. Tackling bends is rewarding, thanks to accurate steering, but the steering is also very sensitive, which will make cruising difficult. Body lean is barely in evidence, while the car is good at absorbing lumps and bumps. If money was no option, we would heartily recommend the 2.0-litre petrol engine that delivers up to 197bhp. It’s smooth and quiet, and offers more punch than the diesel units. It’s also pretty damn fast, and can do 0-62mph in 6.6 seconds. It doesn’t come with the full six-cylinders that you’d prefer, though. Instead, it gets just four. However, a more expensive 503bhp Quadrifoglio does get six cylinders, and can rocket you from a standstill to 62mph in 191mph. A 2.2-litre diesel engine rounds the range off. It’s available in 148 or 178bhp guise, with the latter doing 0-62mph in a fairy brisk 7.1 seconds, and the former dong it in 8.2 seconds. Both offer excellent savings on fuel. The interior is driver-oriented, and has a luxurious feel to it. It’s subtle but modern, and comes with a simple dashboard that’s free from button clutter. The screen is angle towards you in such a way that the controls are easy to find and use, while an easy-to-use rotary control knob makes flicking through your settings and music a cinch. We especially like the decision to set the 8.8” infotainment screen behind the dash – it adds a real touch of flair. In terms of build quality, this Alfa Romeo Saloon can’t match its premium German rivals, but you can’t argue with the quality of the materials. Overall, the cabin is comfortable and feels upmarket. The Giulia is practical, and can boast the lengthiest wheelbase in this class. This means adults up front and in the back get plenty of leg and knee room, though it’s really restricted to four passengers. A fifth, middle-seated passenger would have to cope with the hump in the floor. The boot is big, and measures 480-litres. That’s competitive with its German rivals, and what’s more it comes with a wide opening which makes it easy to load your heavier items. However, the load lip is fairly high. The standard Giulia model is decently equipped, and gets 16” alloys, a 6.5” infotainment screen, cruise control and air conditioning, while the Super trim gets 17” alloys, better interior trim, and a bigger 8.8” infotainment screen. The Speciale offers niceties such as a 7” TFT instrument cluster, 18” alloys and a sport pack, while the high-performance Quadrifoglio model adds 19” alloys, a sports steering wheel, and a fully leather interior. Prices for the new car start out from just over £28,000. For more information on our leasing deals, you can check out our page here. Both private and business buyers are big winners when it comes to fuel economy, with the diesel engines very competitive with rivals. The petrols don’t return woeful figures either, though the best fuel economy is managed by the 2.0-litre 197bhp, which returns 47.9mpg at best. It also costs £130 per year in road tax. The diesels make for much better reading. The 2.2-litre diesel can return 67mpg in either power guise, and will only cost you £20 per year in tax. The Quadrifoglio is the show-stealer in the range that we all want, but with fuel economy returns of 34.4mpg and an annual road tax bill of £270, few of us will be snapping it up. Alfa Romeo has got a reputation for building brilliant petrol engines, and they’ve solidified their rep here. Power and performance run through the range. It’s in Alfa Romeo’s DNA to look suave. As ever, the Giulia dons its sharpest Italian suit and is easily one of most handsome cars in this sector. The Giulia is fast, fun and – if you opt for the Quadrifoglio model – furious. Sometimes you don’t mind a firmer ride, but sometimes you want things to be softer than they are. Shock and lots of horror at this one. The range needed a manual ‘box. Let’s see how the Alfa Romeo Giulia fares against two of its rivals in the comparison section of our Alfa Romeo Giulia review. 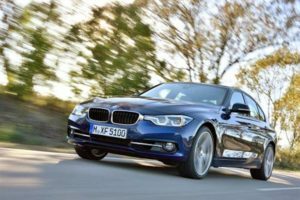 The new BMW 3 Series Saloon continues to set the benchmark in the exec-saloon class. For many, it’s the quintessential car of its type and is highly desirable. The 3 Series is massive fun to drive, no matter which model you go for. The suspension is firm, there is plenty of grip on offer, while the steering is nicely weighted. There is a bit of a dead spot in your steering when you get up to speed on the motorway, but that’s a minor criticism. The petrol engines all offer stellar performance, starting with a three-pot 1.5-litre 318i unit that can do 0-62mph in 8.9 seconds. But if it’s pure speed that you want, the 340i is the fastest model outside the M3, and it can rocket you from a rest to 62mph in 5.5 seconds. It’s electrifying, and even manages to be comfortable if you select Comfort mode from the optional adaptive M Sport suspension. The diesels are pretty fast too, with the 320d able to do 0-62mph in 7.5 seconds. This engine is also frugal, and can achieve average fuel economy returns of 74.3mpg. Impressive. The 330d drops down to 56.5mpg, while the 335d can return fuel economy of 51.4mpg. However, the petrols are a safe option if you aren’t planning on covering many miles. The 318i is the cheapest to run, and can return 51.4mpg at best. It’s hard to find any fault with the BMW’s interior. The design is classy, the layout is logical, and the materials used are all of a high quality. The driver-focused dash sports a wraparound design, and like the Giulia, the dials and controls are angled towards you. The 3 Series also fares well on the practicality front, although it isn’t as spacious as the Alfa Romeo Saloon. It’s actually even smaller inside than the VW Passat, despite being the biggest 3 Series ever. A high transmission tunnel in the centre won’t do a fifth passenger any favours either. On the plus side, it’s easy enough for the driver and their passenger to get comfortable upfront, while there are plenty of handy storage spaces here and there. Visibility is excellent, while the 480-litre boot is the same size as the Giulia’s. 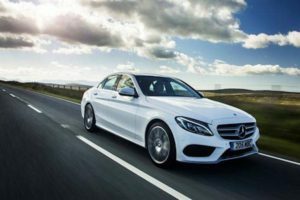 The new Mercedes C-Class Saloon is luxurious, efficient and comfortable, and will make it hard for you to make your mind up! The new C-Class weighs less than last time, largely thanks to the handiwork of the Mercedes designers. The result is a more nimble car that’s better in corners. Four driving modes mean you can tweak the settings until you get it to drive how you like, while ride quality comes down to which model you go for, as there are different suspension setups. When it comes to the petrol engines, there isn’t much to choose from as they all perform similarly. We like the C200, which does 0-62mph in 7.5 seconds, and which is well-suited to the city. Out on the motorway, it’s less adequate. A petrol-hybrid boasts good running costs and can do 0-62mph in 5.9 seconds, while the AMG C 63 is absolutely brutal, and does the same distance in just 4.7 seconds. The 2.1-litre diesel engine spoils things a little by being so noisy, but the noise is not entirely its own fault – the C-Class is so quiet that you can’t help but hear the diesels sonorous notes. Fuel economy has improved by around 20% on the whole, which is very pleasing. Resale values are good, too. The cheapest diesel to run is the C220d, which is good for 70.6mpg while costing just £20 per year in road tax. BiK is 20%. The hybrid can achieve returns of 78mpg and is free to tax, while the C200 petrol averages returns of 53.3mpg. The interior is a real treat. Fit and finish is great, the design is smart, while the seats offer plenty of comfort. The dash is stylish and marked by good quality, and standard kit is generous. Go for the diesel, though, and you will hear a fair amount of noise in the cabin. The petrols, however, are super quiet. The C-Class has bigger dimensions than last time, which means there is more room indoors. Interior space upfront is excellent, while there should be enough in the back for most adults. Passengers could do without the sloping roofline, though, while foot space is wanting. A large glovebox and a few door bins are part of the handy storage spaces, while the boot offers the same amount of space as the Alfa Romeo and BMW – 480-litres. It looks gorgeous, it drives superbly, and it’s a spicier alternative to the rather predictable German exec saloons. The engine range is bursting with flavour, with only a few minor criticisms blockading a straight “Yes, I’m buying this car!” affirmation. These criticisms include the lack of a manual transmission and a ride that gets too firm at times. Other than that, the debonair Alfa Romeo Giulia Saloon really is a bang-on choice.